Stevia Extract - 1 lb. Stevia rebaudiana is a natural herb that grows in Asia and South America. This supplement is a 100% pure concentrated extract of Stevia. South American natives have used Stevia for centuries; though it has just recently become popular in the United States. 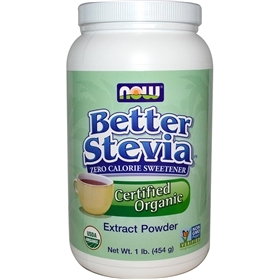 NOW Stevia Extract is made with a high glucosylstevioside content and has a pleasant, non-bitter aftertaste. It's 300 times sweeter than sugar, so it only takes a small amount to produce the same sweet taste. Stevia has been used as a sweetener in many cultures for centuries, but is only recently gaining acceptance in the US as a sugar substitute. Suggested Usage: As a dietary supplement, take 1/4 of a 1/8 teaspoon (1/32) as desired.